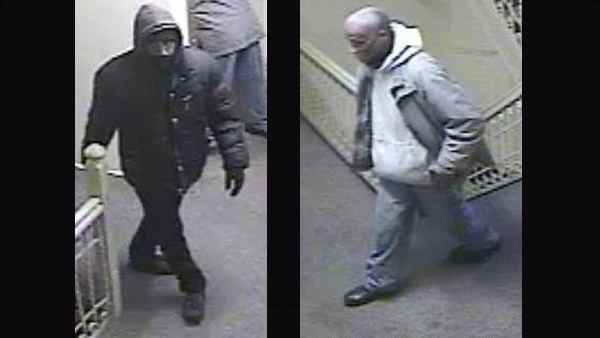 HARLEM, New York (WABC) -- Police are looking for two people who forced their way into a family's home in Harlem and assaulted them. Around 7 a.m. March 20, two people went into an apartment building near Seventh Avenue and West 111th Street, and waited outside the victim's apartment, police said. According to the New York City Police Department, when the victim tried to leave the apartment with her two children, a 9-year-old boy and a 5-year-old girl, the suspects pushed their way into the home with a weapon. The victim began to scream and a man who was sleeping inside came out and struggled with the individuals. He was pistol whipped by the two, police said. Then the suspects fled. The mother and children were uninjured. The first suspect is described as a black man, about 40-50, 5 feet 10 inches, 220 pounds with a medium complexion, salt and pepper hair, and a gray coat, gray hooded sweatshirt, blue jeans and black shoes. The second suspect is described as a black man, 40-50, 5 feet 10 inches, 220 pounds, with a medium complexion. He was last seen wearing a black coat, black hooded jacket, black hat, black jeans and black shoes.